The announced trial run of the first stop of the BTS skytrain’s extension — from Bearing to Samutprakarn — has been postponed until March of next year. The first extension stop, which was supposed to take passengers from Bearing to Samrong, is now supposedly opening on March 1, which is four months later than the originally announced Dec. 5 opening date. The late start is being blamed on debt issues between the Mass Rapid Transit Authority of Thailand (MRTA) and City Hall. 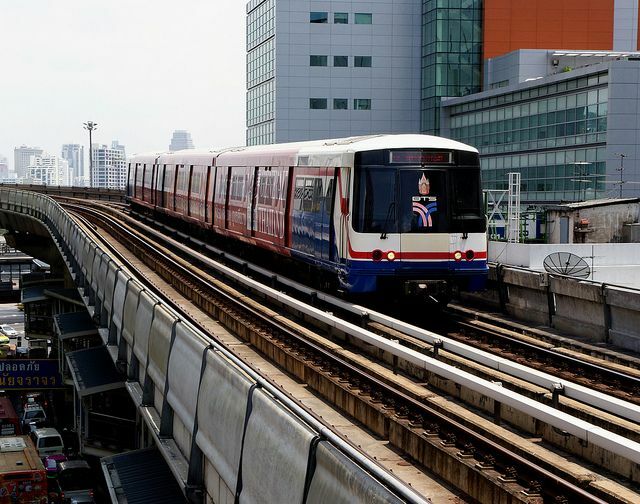 While the Bangkok Metropolitan Administration (BMA) owns the skytrain line, the new stops are being paid for by the MRTA because the BMA did not have the cash, reported Bangkok Post. When complete, the southern extension will be 12.8km and boast nine new stations from Bearing to Samut Prakan. All of it is scheduled to be open in 2017 and the total cost was projected to be THB21.4 billion. The new stations include: Samrong, Pu Chao Saming Phrai, Erawan Museum, Naval Academy, Samut Prakan City Hall, Srinagarindra, Phraek Sa, Sai Luat and Kheha Samut Prakan.